A McLean, Virginia, lawyer and his wife testified Tuesday about surviving a brutal, bizarre home-invasion attack that prosecutors say was carried out by another pair of lawyers. Leo Fisher described at a preliminary hearing Tuesday in Fairfax how Andrew Schmuhl forced his way into Fisher's home and shot him with a Taser. "I saw him point something at me and Taser me," he said. "I fell to the floor and I was just seizing for some period of time." Then his throat was slit. "The next thing I know he jumped on top of me, put a pillow over my head and slit my throat," Fisher said. 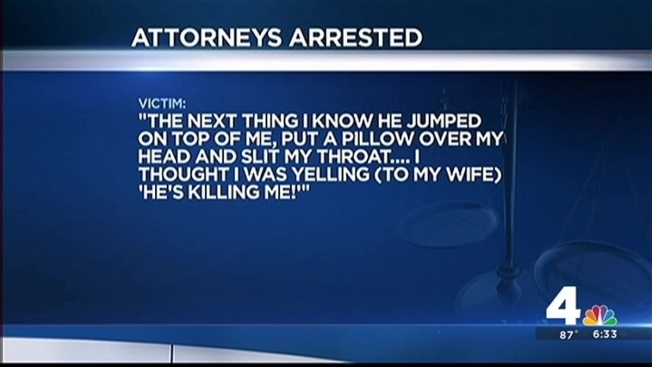 "I thought I was yelling (to my wife), 'He's killing me!'" Late Tuesday, the case was sent to a grand jury, setting it on a path toward a criminal trial. Leo Fisher's wife, Susan Duncan, wept as she described seeing her husband attacked and his throat slit. She was shot in the head and stabbed. "He raised a gun and he shot her ... and I thought he killed her," Fisher said. The bullet grazed her head. "He raised his hand up, and I saw a gun in his hand," Duncan testified. "I felt the bullet and I fell." Fisher said Andrew Schmuhl pretended to be a law-enforcement officer during the attack and interrogated him about his law firm. Andrew Schmuhl and his wife, Alecia, planned the November attack in retaliation for Alecia Schmuhl getting fired from Fisher's law firm, police said. Andrew Schmuhl carried out the attack while his wife waited in the car, authorities said. Police apprehended the Schmuhls in a Springfield shopping center after a short car chase.